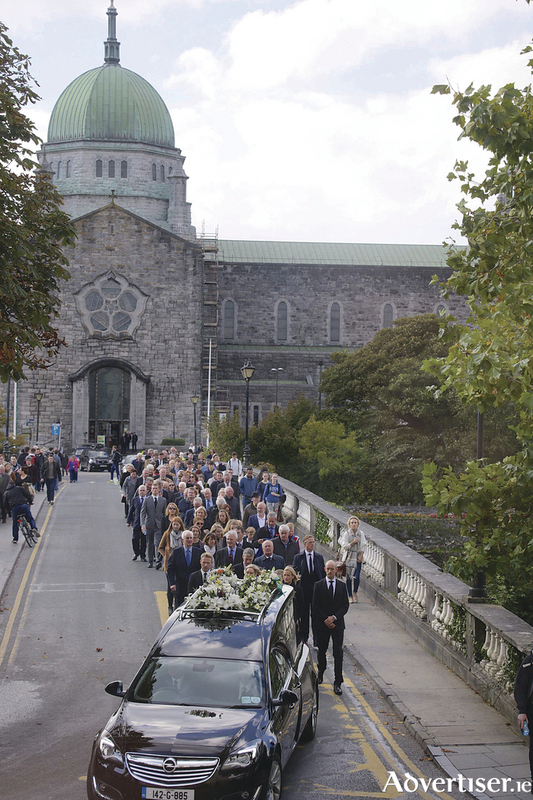 Bobby’s last journey — the funeral leaves Galway Cathedral yesterday afternoon. Pic: Mike Shaughnessy. Galway city centre came to a standstill yesterday (Wednesday ) afternoon as the city paid its last respects to former minister Robert Molloy who died last weekend aged 80. Thousands packed into Galway Cathedral for the funeral mass for the former TD with many of his former colleagues from the world of politics attending to show their respects for a man who represented Galway in Dail Eireann from 1965 to 2002. Even in Dublin yesterday, his contribution to Irish life was remembered with the tricolour flying at half mast over Leinster House. Throughout his career, Mr Molloy was an important political figure and was involved in many of the biggest political events during the period. His decision to leave Fianna Fáil and join the fledgling Progressive Democrats in 1986 sent shock waves though the political system and helped to propel the new party to its election breakthrough in 1987. The chief celebrant at the Mass, Fr Gerry Jennings spoke of the great integrity and gravitas of the former minister, while his daughter Sinead told the congregegation that her father was a great listener and always gave sound advice. After the Mass his funeral cortege was led through the city by members of the city council in their robes as Bobby Molloy served as mayor of the city from July 1968 to June 1969. A guard of honour was also held by the members of the Jes rowing club who held oars aloft as the funeral passed by on its way to the New Cemetery at Bohermore. Among the mourners were former PD leader Des O’Malley, Fianna Fáil leader Michael Martin, former Tánaiste Mary Harney, former Taoiseach Brian Cowen, and former Justice Minister and former Tánaiste Michael McDowell. that throughout his career, he gave excellent service over several decades and his name is recalled with great affection throughout the constituency. “His life in politics began before mine, and on every platform he served, he delivered his contribution, which was always well informed, with great distinction. “He earned the respect of both his supporters and opponents because of the integrity with which he held his views,” concluded President Higgins. During the service, gifts were brought to the altar by Mr Molloy’s sisters, Adrienne and Patricia.